This smoothie recipe is a great way to start the day and doesn't involve consuming a big heavy meal. When you pack it full of super healthy ingredients it can easily replace the standard breakfast or even help reduce the amount of stimulants required to meet the demands of your active day. Making your own smoothie is a much better alternative over packaged blended beverages that have been sitting around for weeks on a grocery store shelf. The next best option is to purchase freshly made smoothies at juice bars, cafes or restaurants. The problem with this, however, is that many tend to be very high in sugar content and not so high in revitalizing nutritive compounds. Making your own homemade smoothies gives you the opportunity to incorporate many different superfoods, herbs and tonics, all in one 8-16 ounce glass. In the recipe below we include many of our top 10 favorites, plus a few other superfoods discussed on the pages of this website for a very special energizing and powerfully purple drink. Smoothies get their name because they have a "smooth" texture. This smooth consistency is often produced when you use some kind of frozen fruit, especially banana. Although not absolutely mandatory, they do provide the famous textural quality that smoothies are known for. Nevertheless, other ingredients like irish moss gel, nuts and seeds, soaked chia or coconut oil can also be added or substituted to likewise create a creamy thickness. Since fruit is often a common ingredient in the average smoothie, we like to try to use seasonal fruits whenever possible and, of course, wild harvested varieties are top on our list. These fruits are an extra special treat and nothing beats freshly picked tree ripened fruit the way Mother Nature intended. 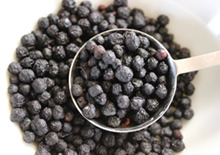 In this smoothie recipe we use one of our personal favorites, the wild blackberry. 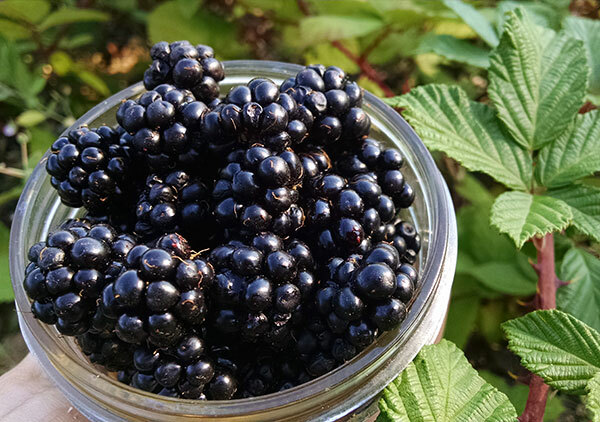 Many wild foods, like berries, often grow so abundantly that you can actually harvest quite a lot in one gathering session. These large quantities can be frozen in smoothie-size portions ready for use when you need them. In this smoothie we also use mineral-rich nettle tea, as well as a goji and schizandra decoction, for the base liquid in this recipe instead of fruit juices or milks. This tea can be prepared ahead of time and kept cold in the fridge for many days' worth of smoothie making. The best smoothie creations, in our opinion, are created using a high speed blending device, like a Vitamix, Blendtec or Nutribullet. These appliances can blend anything from large frozen fruit pieces to small tiny chia seeds. Blended foods are often a convenient meal option for a busy schedule and active lifestyle. Once you have a pantry full of antioxidant and nutrient filled powders, berries, algaes and seeds, the rest is a fairly simple process. You can even make a big jar of mixed smoothie components to have on hand for scooping into your blender mug. Smoothies, as well as raw soups and shakes, are pre-digested liquid foods that are way easier to digest, assimilate and nutritional utilize. 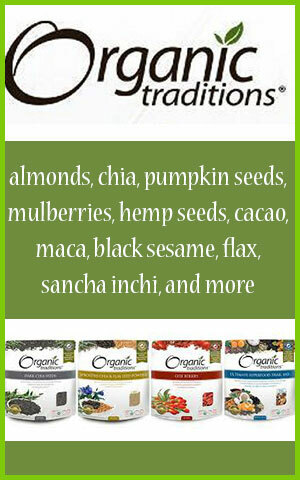 They are a practical way to integrate high quality nutrition and an easy way to ingest many superfoods all in one meal. Moreover, many herbs and superfoods are often alchemically enhanced when used together in this manner. 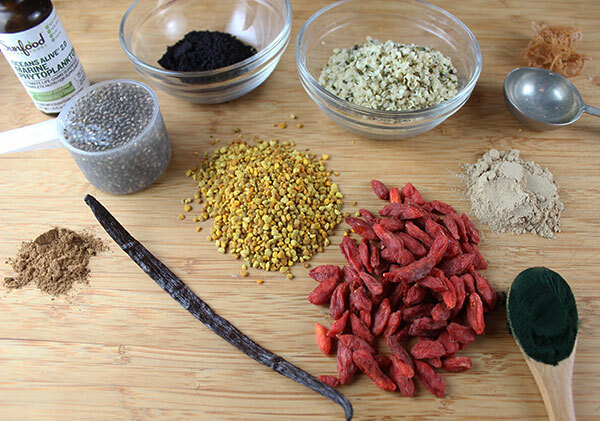 The irish moss and chia seeds incorporated into this recipe are "time released" foods and energizing fuel sources, that help to deliver nutrients over a longer period of time for a slower and more sustained nutritional uptake. They both also work, along with aloe vera, to cleanse the colon and normalize bowel movements. This smoothie recipe makes approximately one 8oz serving. 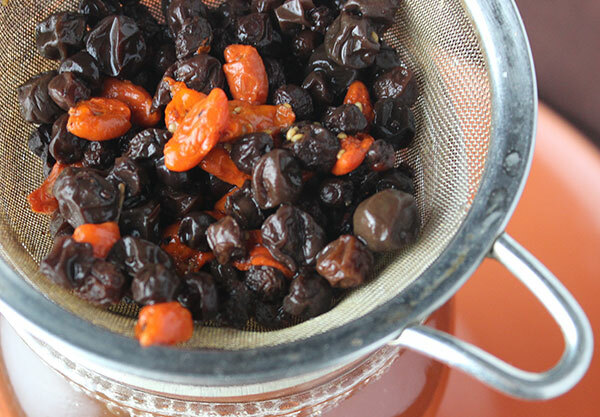 Simmer 2T (soaked and strained) schizandra berries and 1T goji berry in a quart of water for 20 minutes. 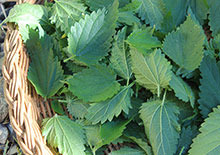 Infuse 1T dried nettle leaf. Strain and refrigerate for later use. 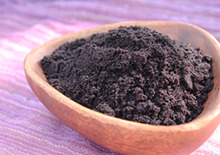 It is good to have a big batch of this tea on hand to add to smoothies during the week. It will last for up to 2 weeks in the fridge. Combine the above ingredients in a high speed blending device. Drink immediately or store in the fridge in an airtight container for later use. 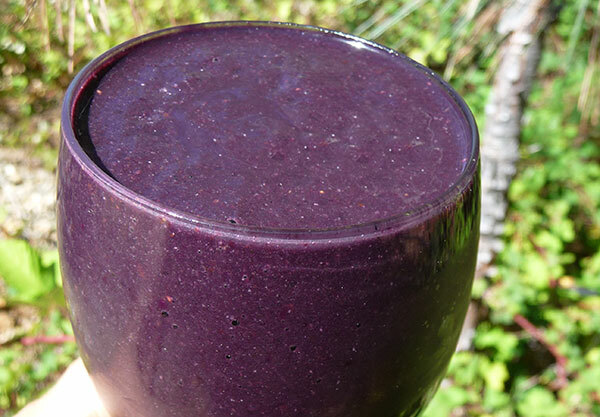 This recipe makes one big, purple, superfood drink. You can add more natural sweeteners or add other other fruits if desired. 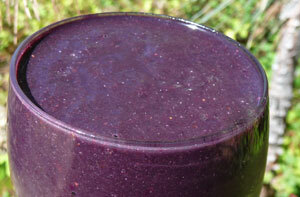 Enjoy this smoothie in the morning or as a mid-day, antioxidant-rich energy booster. For optimal digestion it is best to drink smoothies as a main entree rather than with meals. You can also add in green leafy vegetables, like kale or collard, to any smoothie recipe and make your own green smoothies. Also see our maqui berry smoothie for another delicious way to enrich a morning smoothie with antioxidant fortified nutrients. For more information about some of the specific superfoods used in this smoothie recipe please visit our pages in the links below.